Judy Young is the Chamber’s Vice President of the Convention & Visitors Bureau, Film and Sports Office. In her position, she is responsible for marketing, public relations, conventions, groups, event logistics, tourism product development, film and sports commission. Young celebrated over 20 years of service with the Texas Chamber of Commerce Executives at their annual conference this summer. She has advanced education in Organization Management from San Diego University and the United States Chamber of Commerce, as well as, Destination Marketing Executive from Purdue University and Destination Marketing Association, Intl. Young began her career in Travel and Tourism at the age of 3 promoting New Braunfels at the opening of the LBJ ranch as the youngest age group swimmer in Texas. 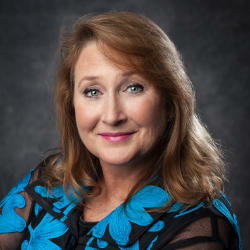 She has over 35 years of experience in the Travel & Tourism Industry. Young is a Multiple Paul Harris Fellow with Rotary International and a member of the New Braunfels Rotary for over 25 years. She is a recipient of the Skinner Legacy Award from the City of New Braunfels Parks and Recreation Department, a past president of United Way of Comal County, board member of Texas Travel Industry Association, Texas Association of Convention and Visitors Bureau, and elected to represent the Texas Hill Country for Governor Perry on the Texas Tourism Advisory Council.